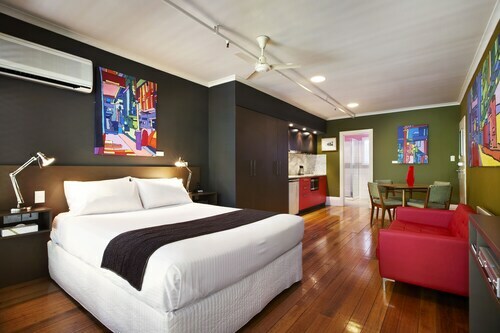 This family-friendly St Kilda hotel is located on the Strip, within a 5-minute walk of Luna Park, St. Kilda Beach, and Palais Theatre. Fitzroy Street and St Kilda Pier are also within 10 minutes. Balaclava Station is 23 minutes by foot. 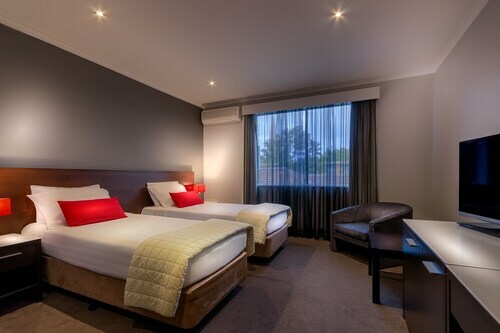 Situated in the entertainment district, this hotel is within a 5-minute walk of St Kilda Road and Fitzroy Street. St. Kilda Beach and Luna Park are also within 1 mi (2 km). Windsor Station is 15 minutes by foot and Prahran Station is 21 minutes. Situated in the entertainment district, this apartment building is within a 10-minute walk of Fitzroy Street, St. Kilda Beach, and St Kilda Pier. Luna Park and Palais Theatre are also within 10 minutes. Balaclava Station is 25 minutes by foot and Windsor Station is 28 minutes. 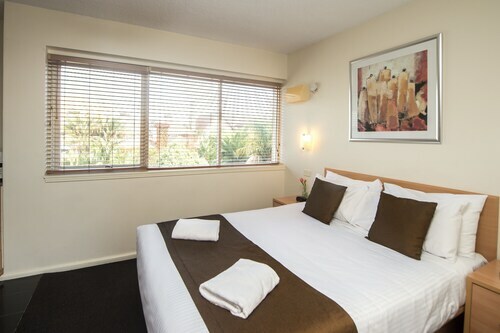 Situated on the Strip, this hotel is within a 15-minute walk of St Kilda Pier, St. Kilda Beach, and Luna Park. Palais Theatre is 0.7 mi (1.1 km) away. Windsor Station is 22 minutes by foot and Balaclava Station is 27 minutes. Situated by the ocean, this luxury hotel is within a 10-minute walk of Fitzroy Street, St. Kilda Beach, and St Kilda Pier. Luna Park and Palais Theatre are also within 15 minutes. Windsor Station is 26 minutes by foot and Balaclava Station is 27 minutes. 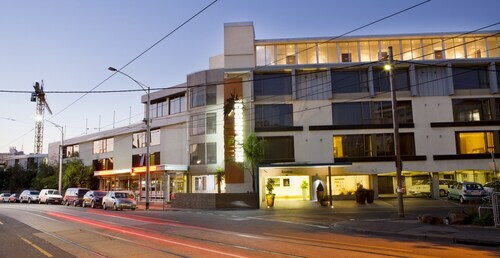 This family-friendly St Kilda hotel is located by the sea, within a 5-minute walk of Luna Park and Palais Theatre. St. Kilda Beach and Albert Park Lake are also within 2 mi (3 km). Balaclava Station is 17 minutes by foot and Ripponlea Station is 24 minutes. For a great getaway, visit St Kilda, one of Melbourne’s quirkiest inner suburbs. Named after a ship that moored at the area’s main beach during the 1800s, St Kilda was previously known by several names including ‘Green Knoll’ and ‘The Village of Fareham’. The area was considered a prime suburb for Melbourne’s elite, with huge mansions and gardens marking St Kilda’s lush green hills and beautiful waterfront. In recent times, St Kilda has evolved into a haven for artists, musicians and other creative sorts, with a bohemian air in the atmosphere. 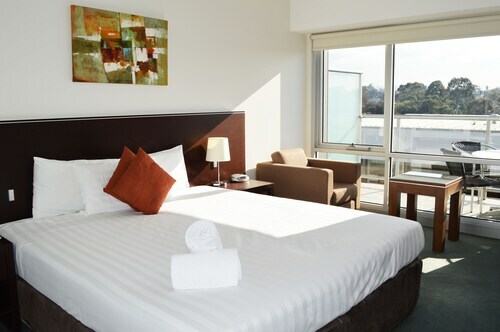 Our St Kilda accommodation options, which include family-friendly hotels and apartments for four or more people, provide the ideal starting point for you to experience everything this area and its surrounds have to offer. St Kilda is home to many of Melbourne’s best-known attractions, including Luna Park. Step through the mouth of the iconic Moonface gate and into a wonderland of retro rides and carnival games. Best of all, entry is free, with visitors paying per ride instead - a perfect day out for families or thrill-seekers on a budget. Too hot for rides? Then why not hit St Kilda Beach, Melbourne’s most famous beach? Relax by the seaside or try your hand at a variety of beach activities and water sports, from windsurfing to sailing, jet skiing to beach volleyball. The truly daring can even skydive! Once you’ve dried off, take a walk down St Kilda Pier to enjoy views of the Melbourne skyline and Port Phillip Bay. See if you can spot the Little Penguins that call the area home! St Kilda has a reputation as one of the best entertainment and lifestyle precincts in Melbourne – not a surprise considering the events held in the area. The annual St Kilda Festival is held throughout the suburb during February and features live entertainment, visual arts, outdoor cinema and forums for the whole family to enjoy. Other events such as the St Kilda Film Festival, held in May and the St Kilda Markets, held every Sunday, also fill the calendar to ensure there’s never a dull time to visit. You can also catch a show at one of the area’s heritage-listed performing arts venues such as the stark white, art deco-style Palais Theatre, or the brickwork Astor Theatre. Those with a need for speed should also note that St Kilda is the perfect place to stay if you’re in Melbourne for the Grand Prix, which takes place around Albert Park. The best thing about St Kilda? It’s easy to get to! Located just 6km from the Melbourne city centre, St Kilda is easily accessible via tram or bus. Want some fresh air? Why not take a walk along St Kilda Road and see the sights before arriving in this urban haven? However you get here, be sure to book your St Kilda hotel to make your holiday in Melbourne’s ultimate entertainment precinct the best! Need insider tips on must-see attractions in St Kilda? Check out our St Kilda travel guide! How Much is a Hotel Room in St Kilda? 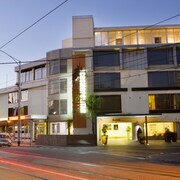 Hotels in St Kilda start at AU$77 per night. Prices and availability subject to change. Additional terms may apply.